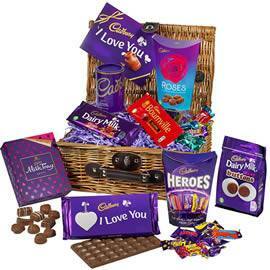 Cadbury is an iconic British chocolate brand and one of the oldest and most popular in the world. 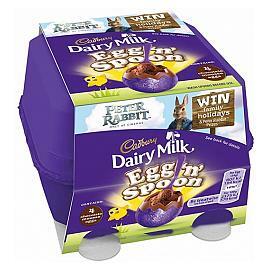 Most famous for Cadbury Dairy Milk, Cadbury Milk Tray and Cadbury Bounville chocolate, Cadbury now have a wide selection of chocolates to suit most tastes and almost everyone has a favourite Cadbury chocolate bar. Cadbury Buttons Easter Egg Small, a small hollow Cadbury Dairy Milk chocolate Easter egg with a bag of Cadbury Buttons. 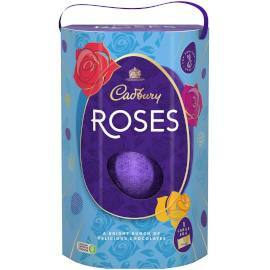 Cadbury Roses Special Easter Egg, a large Cadbury milk chocolate egg and Cadbury Roses. 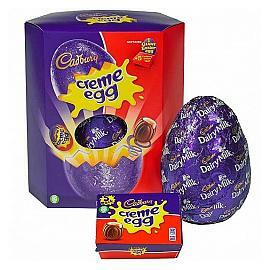 Cadbury Creme Egg Giant Easter Egg, a giant Cadbury milk chocolate Easter egg and five Cadbury Creme Eggs, the biggest Easter egg from Cadbury. Cadbury Dairy Milk Giant Easter Egg, the biggest Easter Egg from Cadbury, with two Cadbury Dairy Milk chocolate bars. 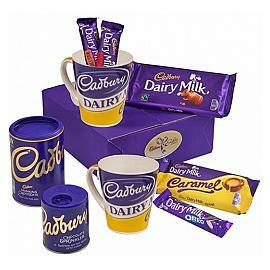 A hamper of chocolate for Valentine's Day from Cadbury, filled with a selection of Cadbury favourites and a special chocolate bar. 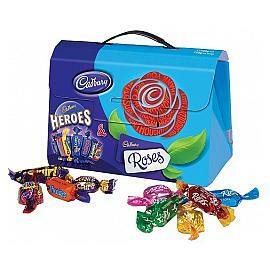 Cadbury Heroes & Cadbury Roses Gift Box Bag, a bag shaped chocolate box with Cadbury Heroes and Cadbury Roses chocolates inside. 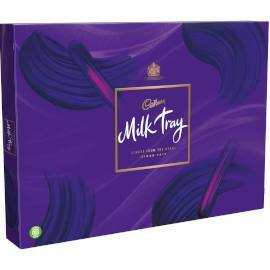 The Cadbury Milk Tray Chocolate Box 530g, the biggest box of Cadbury Milk Tray and the most popular box of chocolates from Cadbury. 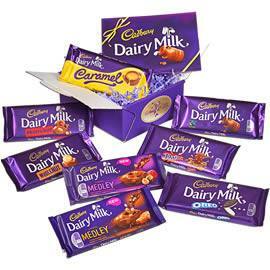 A selection of Cadbury Dairy Milk chocolate bars presented in a Cadbury gift box. Eight full sized Cadbury Dairy Milk chocolate bars. 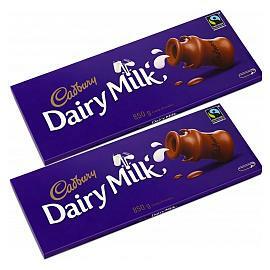 A pair of Cadbury's best selling and biggest chocolate bars, the Cadbury Dairy Milk 850g Chocolate Bar Twin Pack. 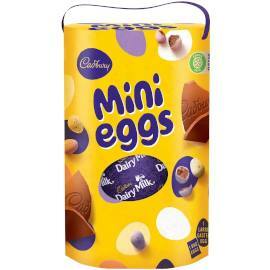 Cadbury Special Mini Eggs Easter Egg, a large Cadbury Easter egg with Cadbury Mini Eggs. Cadbury Chocolate Egg 'n' Spoon Double Choc, four milk chocolate eggs with a choc mousse centre. 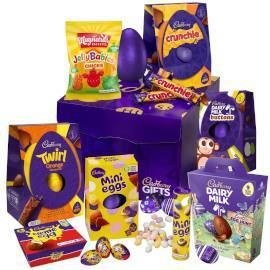 A deluxe gift box filled with Cadbury Easter eggs of all different sizes; the Cadbury Deluxe Easter Egg Gift Box. 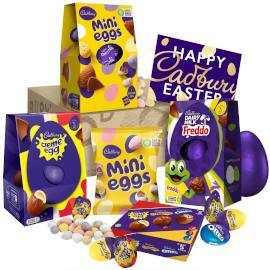 Cadbury Family Easter Egg Selection, a selection of Cadbury Easter eggs, perfect for sharing with the family. 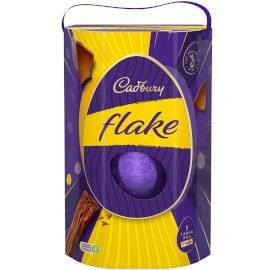 The Cadbury Flake Special Easter Egg, a milk chocolate Easter egg with three Cadbury Flake Bars. 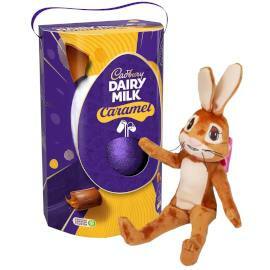 Cadbury Caramel Easter Egg & Cadbury Caramel Bunny, the biggest Cadbury Caramel Easter egg and a cute Caramel Bunny soft toy. 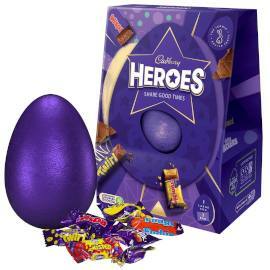 Cadbury Heroes Easter Egg, one Large Cadbury egg with all your miniature favourites, Cadbury Heroes Easter egg. 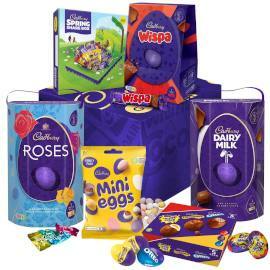 Cadbury Large Easter Egg Collection, Cadbury's Essential Easter egg hamper packed with chocolate Easter eggs of all sizes for Cadbury. 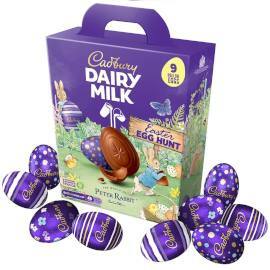 Cadbury Easter Egg Hunt Pack, Cadbury's Easter Egg Trail Pack, create your own Easter egg hunt or Easter games with the Cadbury Easter Egg Hunt Pack. 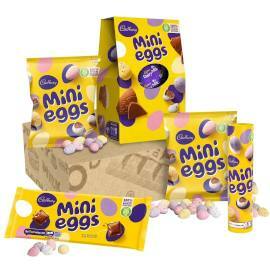 Cadbury Mini Eggs Easter Gift Set, a gift set of Cadbury Mini Eggs for Easter, milk chocolate eggs with a crisp outer shell. 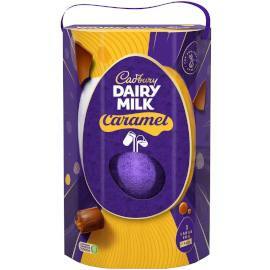 Cadbury Large Caramel Dairy Milk Easter Egg, a large Cadbury Dairy Milk Caramel Easter egg with Cadbury Caramel Bars. 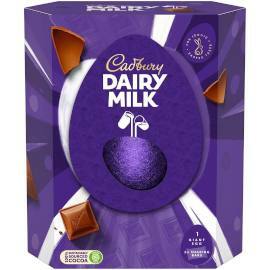 Cadbury Large Dairy Milk Easter Egg, Cadbury Dairy Milk Easter Egg... a secret recipe of Easter Joy. 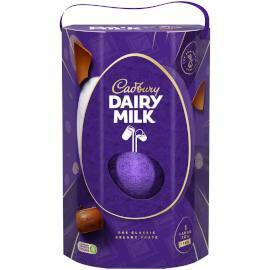 Cadbury Dairy Milk large Easter egg with three Cadbury Dairy Milk chocolate bars. 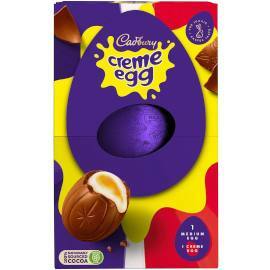 Cadbury Large Creme Egg Easter Egg, a hollow milk chocolate Easter Eggs with two Cadbury Creme Eggs. 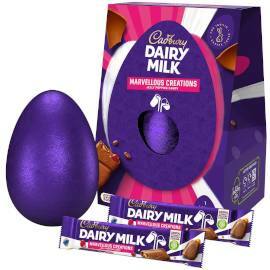 Cadbury Marvellous Creations Easter Egg, celebrate Easter this year with this Dairy Milk Marvellous Creations egg. A milk chocolate egg with two chocolate bars. 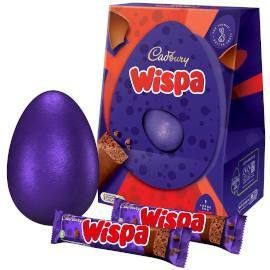 Cadbury Wispa Easter Egg, a large Cadbury Wispa milk chocolate Easter egg with two Cadbury Wispa bars. 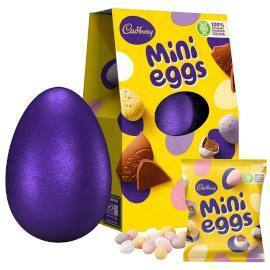 Cadbury Mini Eggs Easter Egg, a milk chocolate Easter egg with Cadbury Mini Eggs. 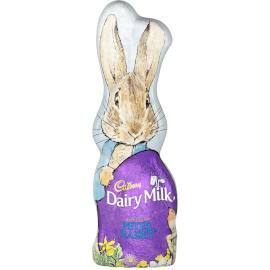 Cadbury Easter Bunny, a hollow milk chocolate Easter bunny from Cadbury. 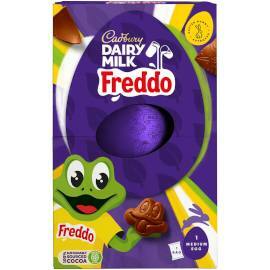 Cadbury Freddo Faces Easter Egg, a Cadbury Dairy Milk chocolate egg with Cadbury Freddo Faces inside!. 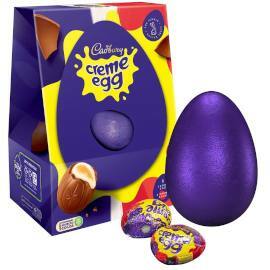 Cadbury Creme Egg Easter Egg, a smooth hollow Dairy Milk chocolate egg and a Cadbury Creme Egg. 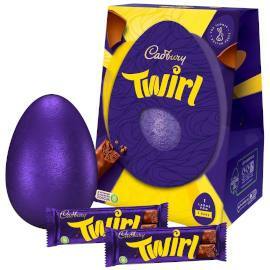 Cadbury Twirl Easter Egg, a hollow milk chocolate Easter egg with two Cadbury Twirls bars. 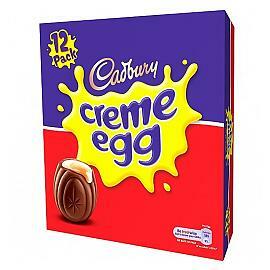 Cadbury Creme Eggs , a box full of fourty-eight Cadbury Creme Eggs. Get them in bulk whilst the season lasts. Here today, Goo tomorrow! 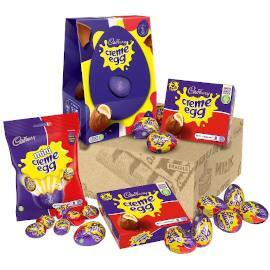 A gift set for Easter with a selection of Cadbury Creme Eggs. 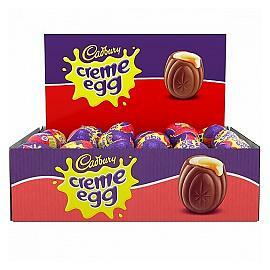 Cadbury Creme Egg 12 Pack, twelve gooey Cadbury Creme Eggs, an Easter favourite, milk chocolate eggs with soft fondant centres. 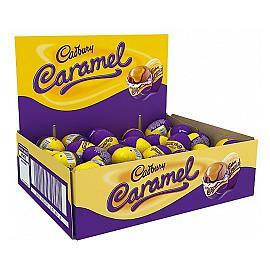 Bulk box of 48 Cadbury Caramel Eggs, Cadbury milk chocolate eggs with smooth caramel centre. 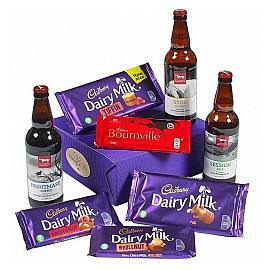 Send a fantastic gift of award winning beers with a variety of the nation's favourite Cadbury Dairy Milk bars. Keep up to date with our chocolate newsletter; new chocolates, chocolate special offers and discount codes, and even the odd chocolate event. Copyright © choc-o-holic 2019. All right reserved.